Just a few days to Christmas and with the cards and letters written, snow on the rooftops and festive music on the I-Player (from the EBU’s wonderful Christmas Around Europe) playing quietly on my computer, I’m ready to wrap up the last two weeks. 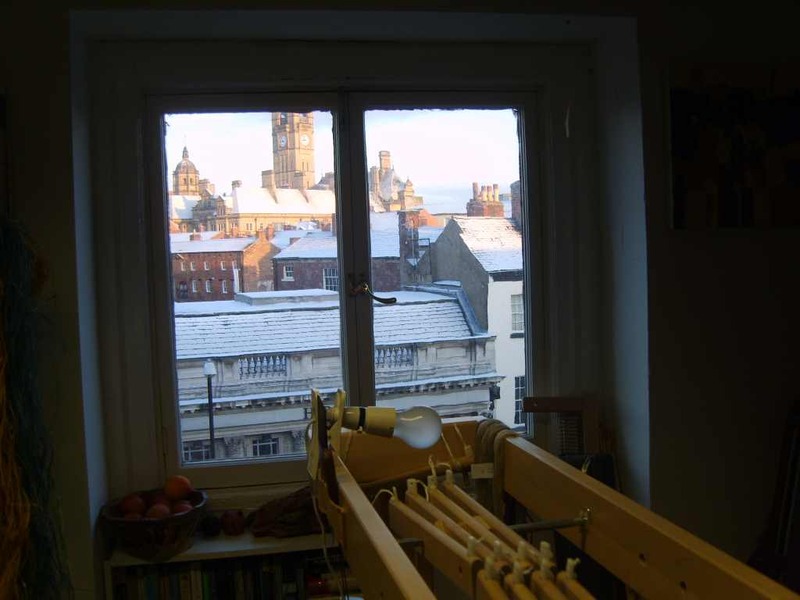 There seems so much to squeeze in – a visit to York for the Sashiko exhibition, breathtaking pictures from ikat weaver Susan Jarmain of her Ontario studio and home, scarves from India, Nepal and West Yorkshire, a Habu discovery, and a proper summary of my own weaving experiments. I’ve tended to leave a report of my own work until last in recent blogs, so not here. A fortnight ago I’d just put on a new ‘spaced’ warp as the next stage in my experimental work with natural fibres, recycled wool and tapestry techniques. This is all in the run up to putting on my first proper paper warp (a 16mm half spun finally sourced from Fibrecrafts). 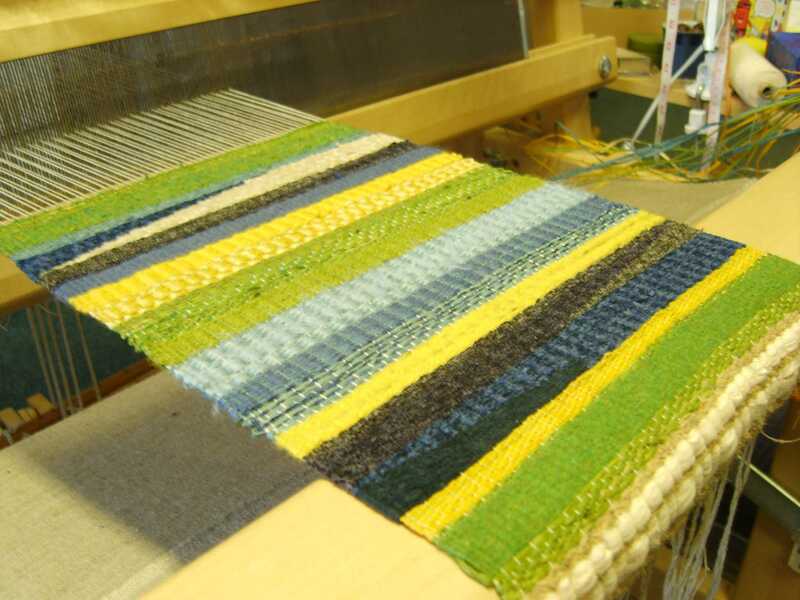 Yesterday I finished a piece that began rather playfully but developed into a central sequence of patterns that investigated how to put raffia and recycled wool side by side, and with different thicknesses of raffia and different intensities of beating down. This has meant finally mastering the ‘two shuttle wrap around at the selvedge’ technique, something I’ve fudged in the past, but now, as you’ll see from the illustrations, really become confident with (even though raffia can be very unforgiving at the selvedge end). 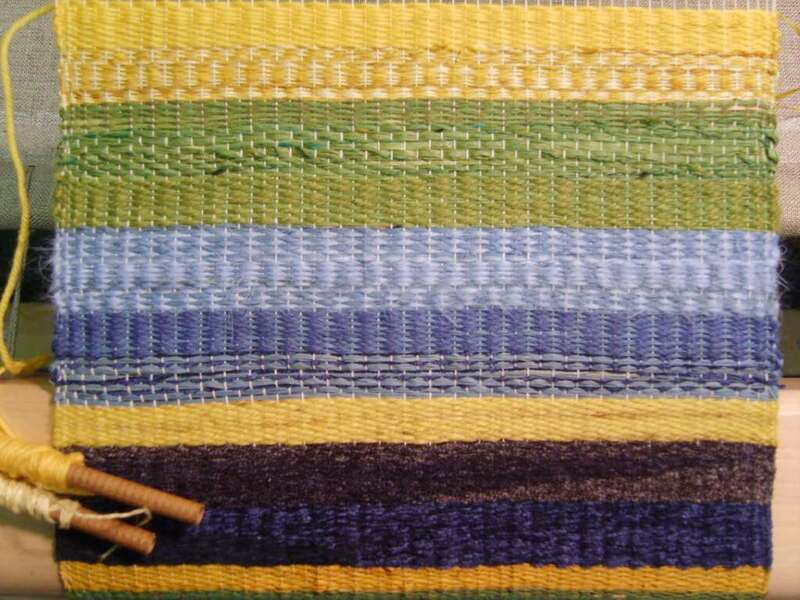 On the way to this central sequence (blue, green yellow) I experimented with some of the chenille yarn I used in my double weave panels (see September blogs). Here I tried the two different approaches to bringing two different yarns together within a single weft pick: interleaving and interlocking. With this chenille, because it packs down so well, there is very little difference in the outcome. When my wife Susan saw my completion of the central sequence she encouraged me to weave a mirror image of the preceding section and make a complete piece, which I’ve done here. Despite my misgivings with progressing this experiment into a finished piece I’ve learnt a lot from persevering to a conclusion. Not least I’ve started to become really aware of how different yarns and fibres react to different warp spacing and how having such different yarns (raffia and wool) side by side affects colour and a shape across the weft. I’m assembling a very small library of yarns I know well enough to work creatively with. This piece probably uses far too many different yarns for good aesthetic sense, but it is a learning piece, and I’ve learnt such a lot! I’m taking time out from all this colour in my next sequence of experiments. These will be with this brilliant white Habu bamboo yarn and some charcoal black recycled rug wool. I’ve been enjoying the challenge of making preliminary drawings by cutting up squares and rectangles of white paper and applying marks and lines in charcoal. 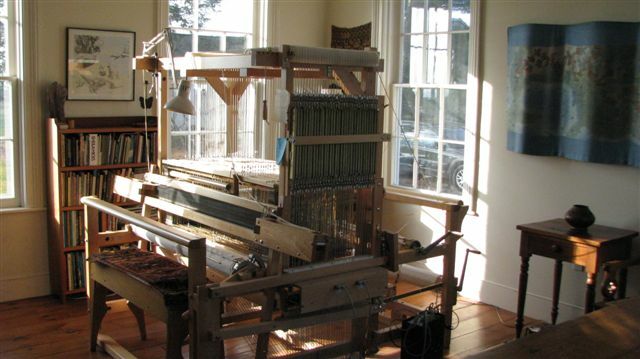 Then, probably after Christmas, it will be the serious business of doing my first paper warp on my own loom and recreating at a larger size those three swatches I made for my ‘final’ Bradford work back in October. I’m sure it’s snowing beside Lake Eire making Susan Jarmain’s lakeside home even lovelier than her springtime pictures show. 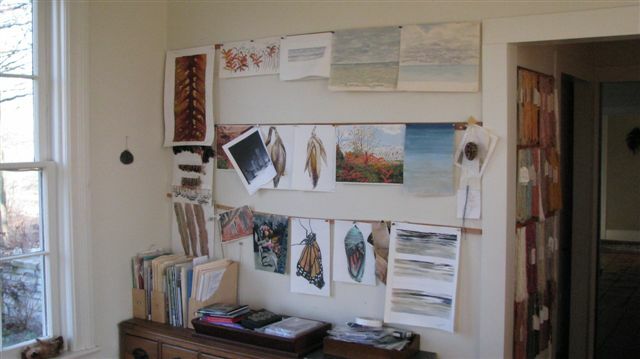 Following her exhibition at the Knit & Stitch Show (see my last blog) she kindly e-mailed me with these images and wrote: The first two images are of the Cliffhouse where I live and work, a 160 year old Ontario farmhouse that my husband and I restored 12 years ago. 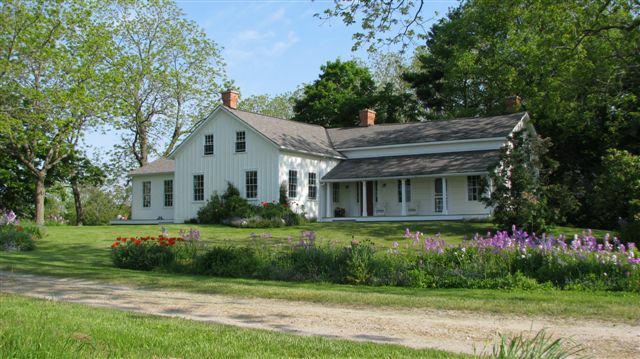 It is the only house at the end of a mile long dead end road on a 125′ high cliff overlooking Lake Erie. While we can see no other houses various forms of wildlife including deer and wild turkeys regularly visit us and we certainly enjoy all of the migrations, from the Tundra Swans in early March to the collection of the Monarchs in September awaiting a north wind to assist them on their journey to Mexico. These images are in my studio: the first of my recently acquired 32-shaft computer dobby and the second of my wall of drawings. I am very much a process person – I always start with drawings (watercolours). They are my way into a project, my way of understanding. The other essential part of my process is my 12′ long table (no image because no work at the moment) where I paint all of the warps. Thank you Susan for so generously sharing these descriptions and images. The power of place is so fundamental to many artists and here is an example of somewhere little short of magical. I could imagine writing some pretty stunning music in the stillness of such a beautiful place. 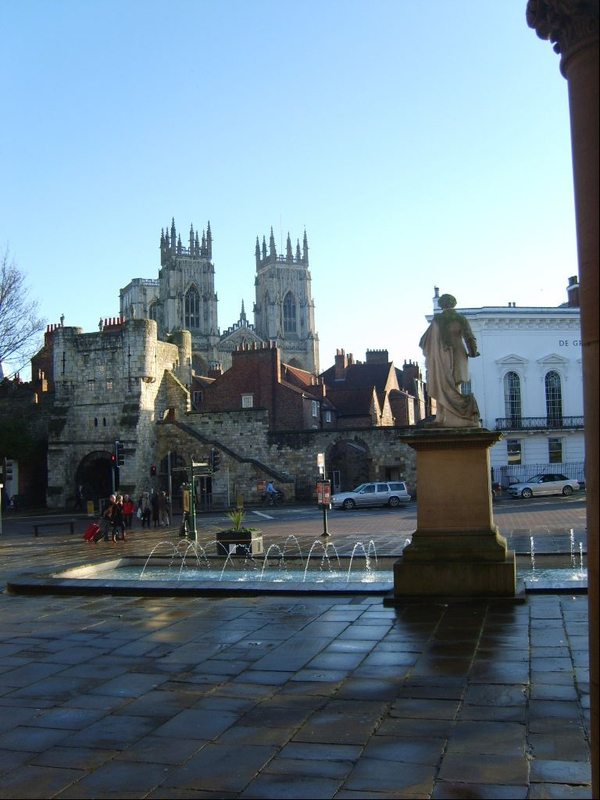 Another beautiful place is the ancient city of York just a 50-minute train ride away. Instead of my usual weaving study day (now usually at home rather than at Bradford College) I invited Alice, my Farfield Mill Residency colleague (see August blogs) to join me to visit the Japanese Sashiko Textile exhibition at York Art Gallery and attend a short introduction by its curator Michelle Walker. I visited Japan first in 1988, but have been fascinated by its culture since I was a teenager and began to study the Ukiyo-e prints (my grandfather had one in his hallway, which I’ve now inherited). 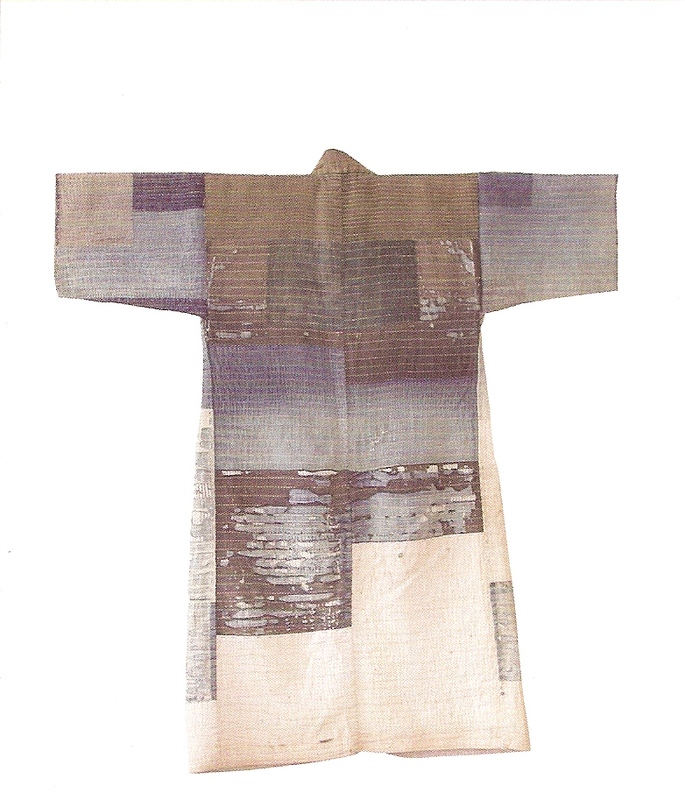 Japanese textiles, as I’ve come to learn very recently, are ‘something else’, experimental and close to the very edge of what can be described as textile. 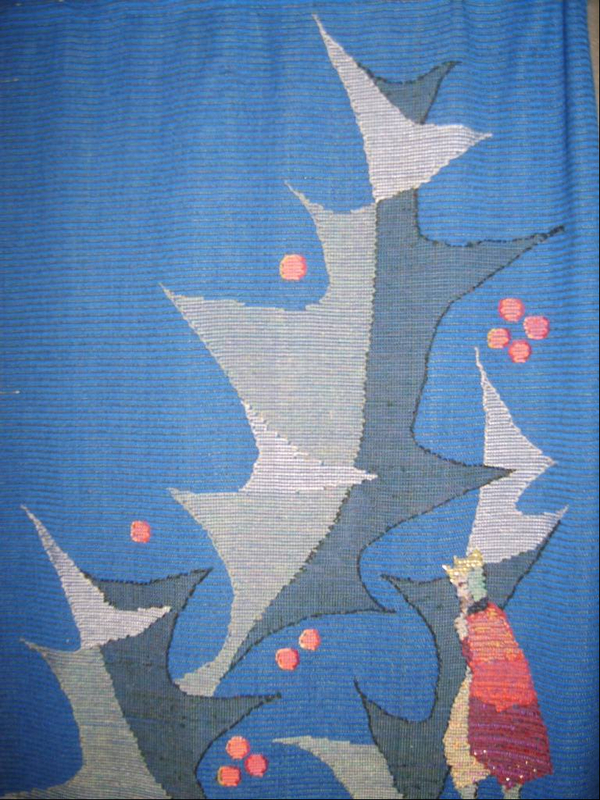 Sashiko is a rural tradition of textile design, making and embroidery, but a tradition that has had a striking impact on the likes of Nuno and weaver / designers such as Misao Iwamura whose book Plain Weaving (the English translation sadly unavailable from Habu but clearly hugely influential in the USA if Brooke’s wonderful blog thedailypurl is anything to go by – this blog must rank alongside Artemis’ Confessions of a Junkaholic as one of the most beautifully presented and authored I have yet to see). The York exhibition takes over the whole of the large ground floor gallery. We spent three hours plus a half hour introduction from the curator, and it simply wasn’t enough. The show is the result of Michelle Walker’s three-year AHRC labours including several trips to the remote island of Sado in Northern Japan. It’s clear that her visits have just managed to capture recollections of the dying embers of a traditional way of life, a life grounded in recycling, making do and mending, and most significantly a relationship with clothes for living and working that if we ever had it in Europe we lost it centuries ago. Imagine as a fisherman, farmer or village firefighter (very important role in timber-built Japanese villages) your daily workwear is created by the women in your family – for life. A work jacket will be created from remnants, home-grown hemp, latterly cotton imports, dyed indigo, stitched in running stitch with elaborated often symbolic patterns ‘protecting’ the owner, constantly repaired by adding layer on layer of material the padding providing air pocket warmth and protection. These unique items, found all over Japan, began to be recognized in the middle years of the 20C when Japan developed its own arts and crafts movement, in which our own Bernard Leech played such a part. Leech’s friend Soetso Yanagi (author of The Unknown Craftsman) and the potter Soji Hamada were hugely influential in safeguarding Japan’s fragile culture following the famous Dartington International Conference of Potters and Weavers in 1952, a conference Leech organised. Each traditional item in this exhibition is an art work, but designed and made as a garment for life. Although the running stitch designs are striking I found the weaves of the cloth on which they are embroidered rich, curious, and inexplicable by turn. I just kept wanting to touch the cloth and get really close enough to see what was going on. Throughout my time in this exhibition I thought ,as I hastily sketched, that I wasn’t doing this justice. 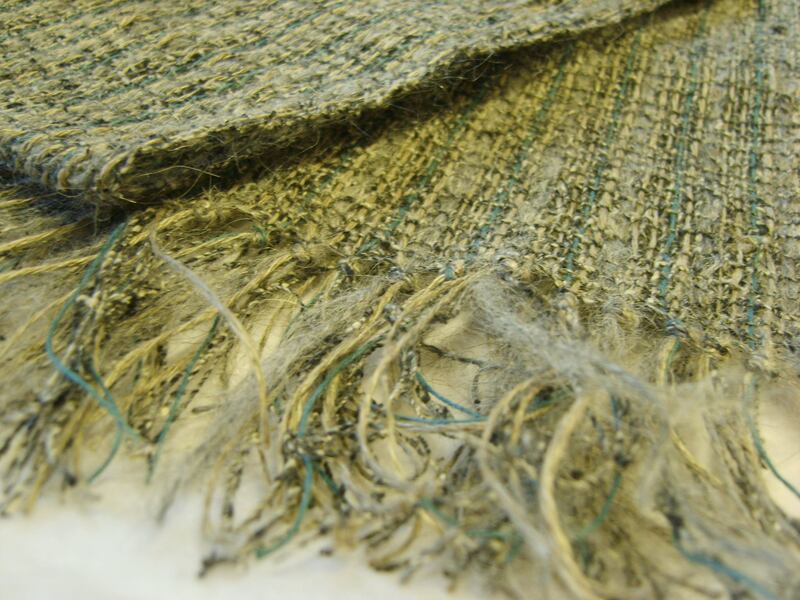 Here was a kind of textile that really affected me. Much of what I was looking at had been worn, and really worn for many years. I thought about those few clothes in my life that had sustained even a short period of regular wear – favourite work jackets so worn and patched to have been ‘disappeared’ by my caring wife – Nigel, you can’t keep wearing that! So, one’s relationship with what one wears changes and becomes so transitory. What is so invigorating about this exhibition is its link with the new. 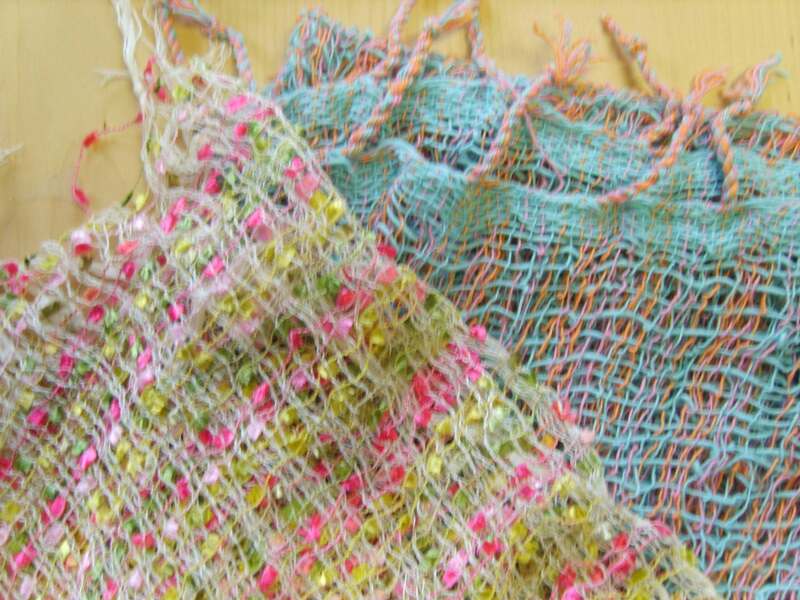 There’s a vivid collection of sashiko-inspired garments and textiles from Tokunaga Miyoko. 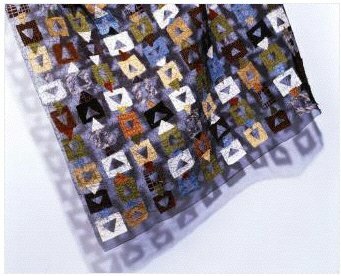 Striking shibori designs feature strongly. Then there is the experimental textile creations of NUNO, particularly those fabric creations made from coloured remnants sewed onto water-soluble cloth that disappears except for an inner structural thread that keeps everything together. 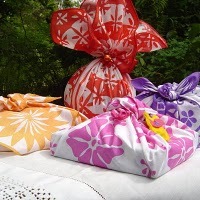 Alice reminded me that we’d seen some recent wrapping cloths or furoshiki in the Japanese tradition exhibited at the Saltaire Festival in September. 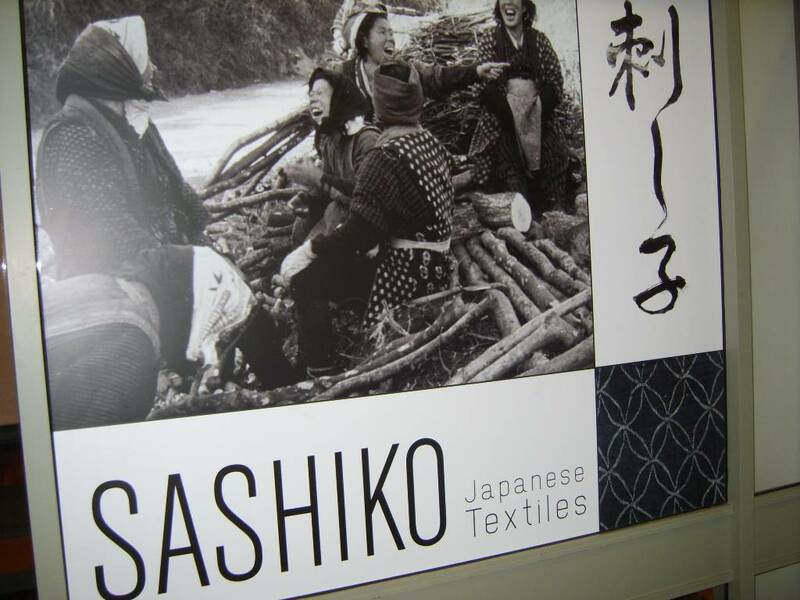 I remember now having a demonstration of the versatility of the furoshiki by Michiko Yasue – and here at this York exhibition in the archival film from the 1950s unearthed in Sado’s museum, there were the cloth bags and carriers made from a single square of indigo dyed cotton. You have just got time to catch Michiko Yasue’s brilliant Advent Calendar on her myfuroshiki blog. But do you dare take your furoshiki to Sainsbury’s and forgoe the plastic bag . . .
Myfuroshiki - from West Yorkshire! After tearing ourselves away from the Sashiko show I had to take the opportunity to visit a unique bookshop just a minute’s walk from the gallery. Janette Ray specialises in books on architecture, arts and crafts, gardens and artists’ monographs. Whenever I go to York to hear the choir my son sings with (the excellent York Cantores), the shop is closed. So suddenly we were there and whilst Alice investigated the Gardens’ shelves (her undergraduate dissertation investigates links between gardens and textiles) I got stuck into Architecture, discovering a book I know I should have bought (and may still). The Crystal Chain Letters – architectural fantasies Bruno Taut and his circle by Ian Boyd Whyte (MIT Press). All further fuel and inspiration for my Utopias orchestral project. Altogether a perfect day . . . complete with a park bench lunch in the sunny Castle Gardens . . . and a welcome train journey for once (a car in York is not recommended as we discovered to our cost the following week attempting to drive to the university for a rare performance of Luciano Berio’s Sinfonia). Back at the studio there are a number of Christmas gifts both outgoing and incoming. There are scarves for two of my daughters, one from India, the other from Nepal courtesy of Tearcraft. Nothing fancy, simply fun to wear for a quiet night in with friends (and not expensive to send!). Incoming, well, a scarf for me woven on a little rigid heddle loom in greys of silk, mohair and hemp with the most vivid linen blue I can hardly begin to describe (from Habu – acquired I believe with great daring of the plastic card at the Knit and Stitch Show). There is nothing more I could possibly say about this lovely scarf except share my photo of it. A Christmas Coda: I took the otter expert to hear her first Service of Nine Lessons and Carols at Wakefield Cathedral before she wisely escaped the snow and ice to South Africa for Christmas. We arrived early and stood before sculptor Austin Wright’s and weaver Theo Moorman’s Wakefield Nativity (featured on these pages in January when I made a complete photographic record of it). There is something still so powerful in that story of those Men from the East travelling to uncover the truth of a supposed incarnation. And the message they might leave us today . . . in the (paraphrased) words of Bishop Lancelot Andrewes in his sermon before King James on Christmas Day 1622. Let us see you fall down. Let us see what you offer.